So I'm sitting with my friend Lawrence, a charter member of the pizza connoisseurs of all creation - Brooklyn Chapter, as we take in Plum on 2nd and 10th. When I told Lawrence where the best pizza in NY would be found (your neighborhood where you grew up), he quickly turned to Joe & Pat's of Staten Island and L&B Spumoni Gardens in Brooklyn. When I told him mine was Brothers, he thought I grew up on Staten Island, home to another great Brother's Pizza. I have to check with Dennis Koines, the owner of the Fresh Meadows location on this one for sure. Well it's a Plum time to start whittling away at NYC pizza as the Mad Greek begins the arduous process of locating the best pizza in NYC for 2011. I don't have a lot of time as the year is drawing rapidly to a close. Today we decided to eat at a place on 2nd ave. and 10th street named Plum Pizzeria & Bar. Plum Pizza makes an artfully crispy pizza, its an old style margherita pizza that was not what I expected when I ordered a Neapolitan (neapolitan). I think it's important to make this distinction and stop the madness of epicurean confusion. What was served last night at Plum Pizza was a classic Queen Margherita (arguably named after my insanely vain Cypriot grandmother). Let's make the distinction, once for all. 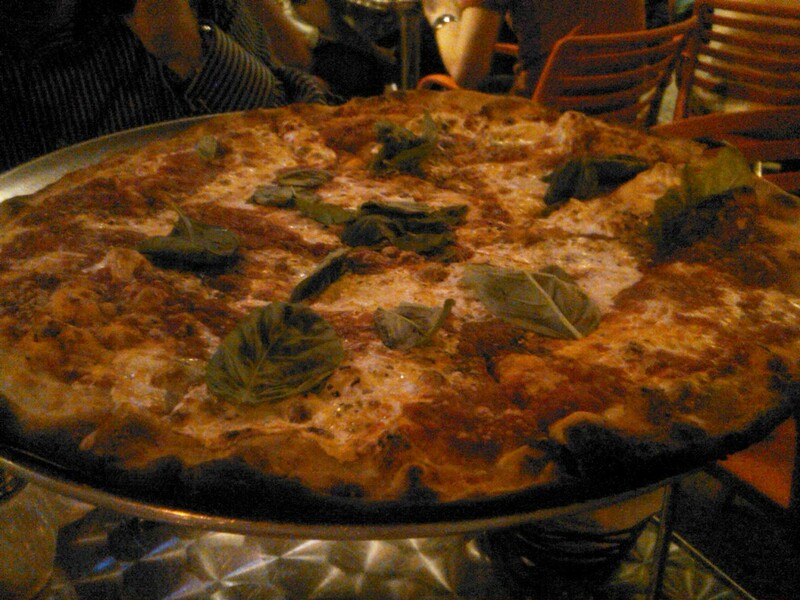 The best Queen Margherita San Marzano so far is at Fanatico in Jericho, NY. As for the masterpiece at Plum, it certainly rates a solid 7 on the scale of a great pie. At first draw, the pizza pulled from the tray with great expectation and a board stiff crispness that one would expect from a premium artesian pie. When asked what I thought of Plum's artful pie by the lovely Ms. Helen of Troy (our most capable Hellenic-Italian hostess), I returned the missive that, "Apparently I have been wrong all along. The Greeks really do know how to make very good pizza." Plum Pizza... Greek owners. Could it be the same Plum as the Plum Agency... Uh, nope. Kudos anyway to Alex and Adonis for their perfectly crisp 3/16 crust and fresh toppings. It may allow one to muse that it makes John's of Bleecker a place that time should forget, instead of a time forgotten. I did ask Helen of Troy if the unexpected Yia-Ya Margherita had fresh San Marzano tomatoes. I didn't get to the bottom of it as well as this fine pizza that made it to the bottom of my belly. I will also give props to their awesome Greek salad, a superb complement to the pizza. I left one slice for the Gods last night and they too did not disappoint. Lawrence and I were visited by a lovely stranger passerby, too shy to sit, but quite fancied by the remaining slice of near perfection. We obliged her enthusiasm. I hope you do the same as to mine and be sure to make Plum Pizzeria a hot spot stop in your quest for the best pizza in NYC. They may take top honors on the best crust, period. Plum's Margherita Pizza is excellent, but lacks a certain something one finds in a well prepared sauce that keeps it from the class of perfection. As for what I was looking for, the classic Neapolitan still has Denino's (Staten Island) and Johnny's (Mt. Vernon) pitching for a year end runoff going into the final turn and stretch run. Plum's Pizza on 2nd ave and 10th street in NYC gets 7 out of 8 slices.